Pictured, Australian fisherman, Billy Brislane. Pictured, Australian fisherman, Billy Brislane. Screen-shot. 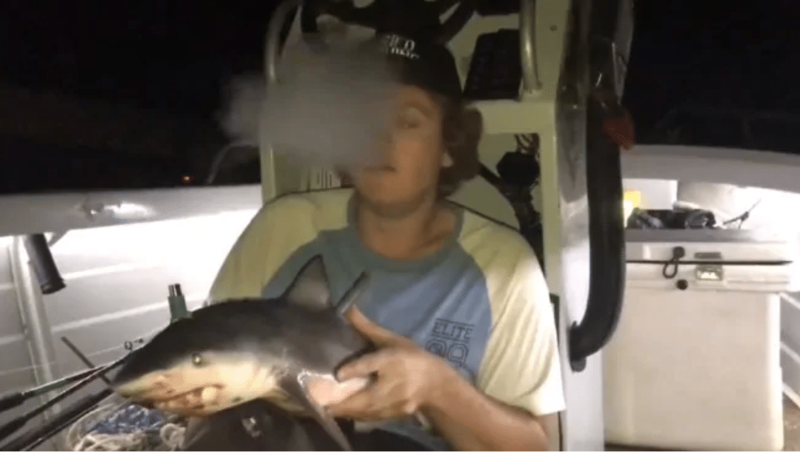 Billy Brislane an Australian fisherman smokes a bong using a dead baby bull shark only to cause uproar on social media after Fried Fishing Australia Facebook post. 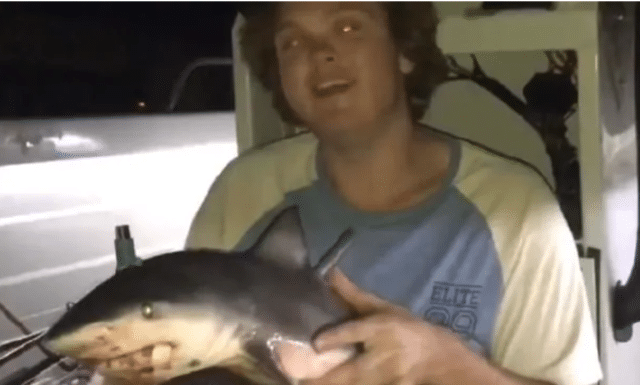 An Australian fisherman has caused disconcert after posting video of himself using a dead baby bull shark as a bong — with the man since quitting social media following an avalanche of death threats. ‘I just want to say thanks to the bunch of sooks who have complained to the point of the police visiting. Honestly, I quit,’ the fisherman, Billy Brislane, said in a now-deleted Facebook post. Commotion follows Brislane initially uploading video to the Facebook page Fried Fishing. 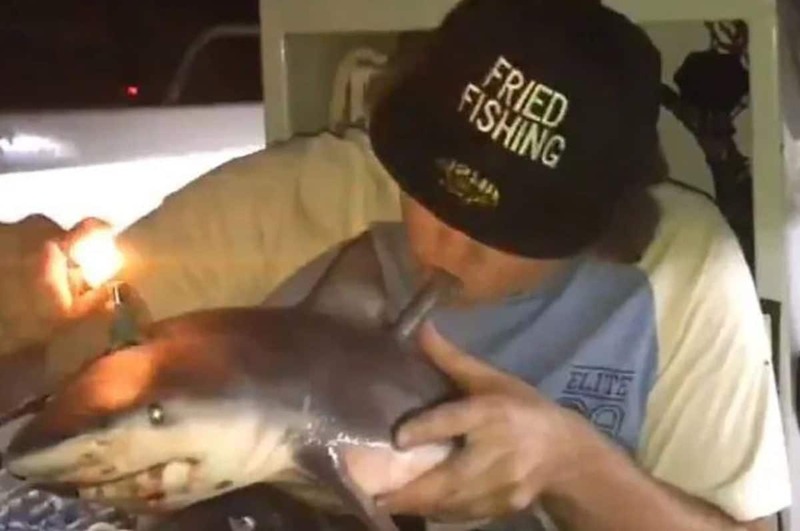 The video showed him taking a puff of smoke from a pipe lodged through the dead shark’s back and another pipe protruding from below its fin. In the background a popular children’s song, ‘Baby Shark,’ can be heard as our collective hero puffs on the makeshift bong. Read the deleted post: ‘Caught by my mate when we were fishing for mangrove jacks on Friday. After two nights left in the icebox, I came up with the idea. There is no possible way it was alive’. Little love lost for Billy Brislane…. Brislane denied he was smoking marijuana and said he’d be willing to take a drug test to prove it, Forbes reported. Drug use or not- the video riled up animal rights activists, with social media users responding in kind. ‘Why is it so hard for human beings to treat #animals with respect? This is sickening, disheartening, and overall SO disgusting,’ tweeted TheFinsUnitedInitiative. Melissa Cristina Márquez, a marine biologist and founder of the Fins United Initiative, said that while the video is “wrong,” fishing for bull sharks is ‘not illegal,’ she told the Washington Post. She said the behavior is appalling nonetheless. ‘It was an animal,’ Márquez said. ‘It was an important part of an ecosystem. To see it disrespected, really does hurt a lot of us in the heart. It gets you right in the gut,’ she said. The video has since led to some wondering to what degree Brislane was informed by the general colloquial, dismissive attitude towards things sacred inherent amongst some punters down under…?